Ko Kret is a small island in Chao Phraya River, just 20 km North of Bangkok in Pak Kret, Nonthaburi Province. 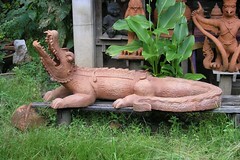 Actually, Ko Kret is not a natural island, but it was created by the construction of a canal in 1722. The island is mainly inhabited by people of the Mon tribe, which originates from Burma. Due to the isolated location of the island, the villagers have kept lots of their original traditions, for example pottery. Ko Kret’s Pottery Village is an excellent place for buying small souvenirs, such as pottery items, candles, leather gadgets, cheap clothing, incense and scented soaps and other handicraft goods. 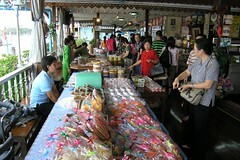 Ko Kret is well-known for Thai desserts. There is a restaurant called “Ban Khun Aell” (บ้านคุณแอ๋ว) which offers a demonstration of how Thai desserts are made. It can be reached by boat. The local drivers know for sure how to get there. Apart from desserts, you can find all kinds of Thai food on the island. Try the fried flowers. Just take your time to look at the small houses of the local and peek into the small alleys, you’ll surely find interesting things to see about the life of the locals. In addition to walking through the villages, I recommend you also take a bicycle and a boat around the island. Bicycles can be rented near the exit of the Pottery Village, around 800 m from Wat Paramaiyikawat. The bikes are not exactly great, but good enough to take you around the island. 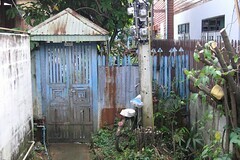 You can hire for 20 Baht per hour or 40 Baht per day. Book the day trip, so you can take your time and explore every part of the island. You can hire longtail boats at just about every pier in the Pottery Village. Apparently there is also a sightseeing tour by boat starting at Wat Paramaiyikawat Pier, which drops you directly at Wat Sanam Neua Pier, which is perfect if you want to return home afterwards. 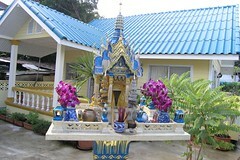 The tour can be booked at a counter at Wat Paramaiyikawat and costs 50 Baht per person. From there you have the choice of taking the Chao Phraya Express Boat directly to Ko Kret or catching a minivan to Pak Kret (10 Baht) and then a bicycle rikshaw (tricycle) to Wat Sanam Neua Pier (วัดสนามเหนือ) for another 10 Baht. 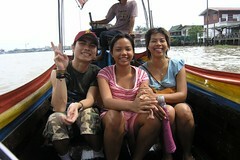 Finally, take the ferry across the river to Wat Paramaiyikawat Pier for 2 Baht. Alternatively, take a taxi from Bangkok directly to Wat Sanam Neua Pier in Pak Kret. If you say “Ko Kret” (เกาะเกร็ด) the driver might or might not know where you want to go. The price should be around 200 Baht, but be aware that there are frequent traffic jams in Pak Kret due to the construction of a major bridge across Chao Phraya River. Thanks to Jarurote for the extensive information he has sent to me!